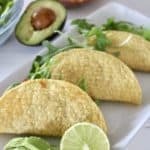 Cowboy Salsa Tacos- Vegan, Gluten Free & Healthy! Boy oh boy do I have a surprise for you! I’m taking a slight detour from Ask the RDN today to show you how these Cowboy Salsa Tacos are pretty much the best thing since sliced bread! Not only are these DEFINITELY part of a cholesterol lowering meal plan, but, they’re also easy on the wallet too! What inspired me to whip up these Cowboy Salsa Tacos? February 21 is a Tuesday. So show us your healthy, creative take on the taco. 1- I had all ingredients on hand. 2- They are easy, healthy and filling! 3- I could make a sweet video, like this one! 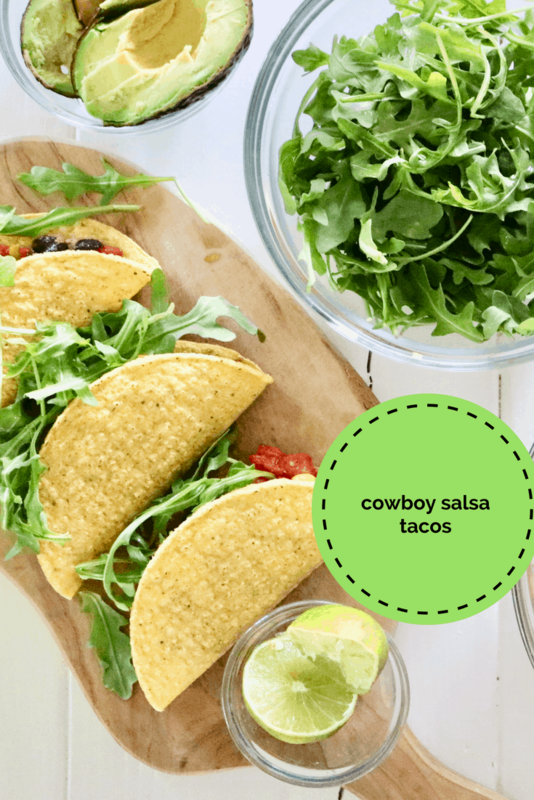 Join the fun and whip up these Cowboy Salsa Tacos for a fabulously festive Tuesday! Cowboy Salsa Tacos are the perfect addition to your Taco Tuesday menu, or, heck, any day of the week! Naturally vegan, gluten free and 100% delicious! In a large bowl, combine beans, corn and tomatoes. Stir in the taco seasoning, salt and 2 teaspoons lime juice. Microwave for 60 seconds, or heat over the stove until warm. In a separate bowl, toss arugula with canola oil and 1 teaspoon lime juice. 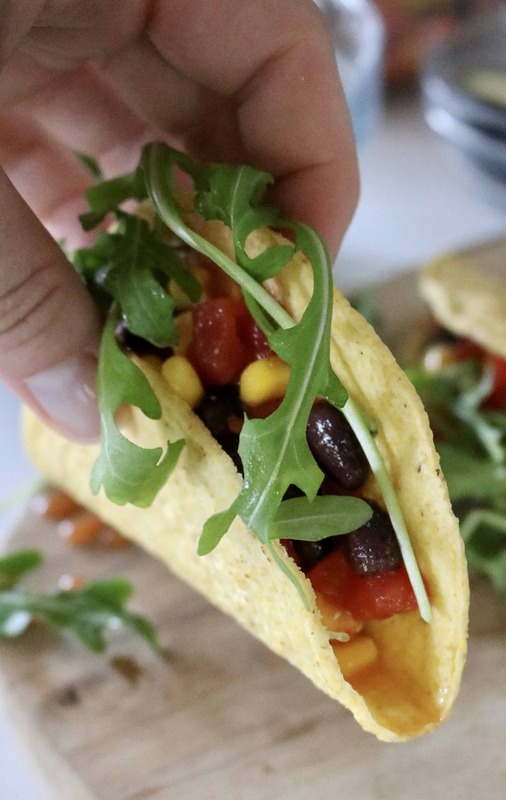 Fill taco shells with bean mixture and top with arugula. Add sliced avocado to garnish and for a healthy fat! 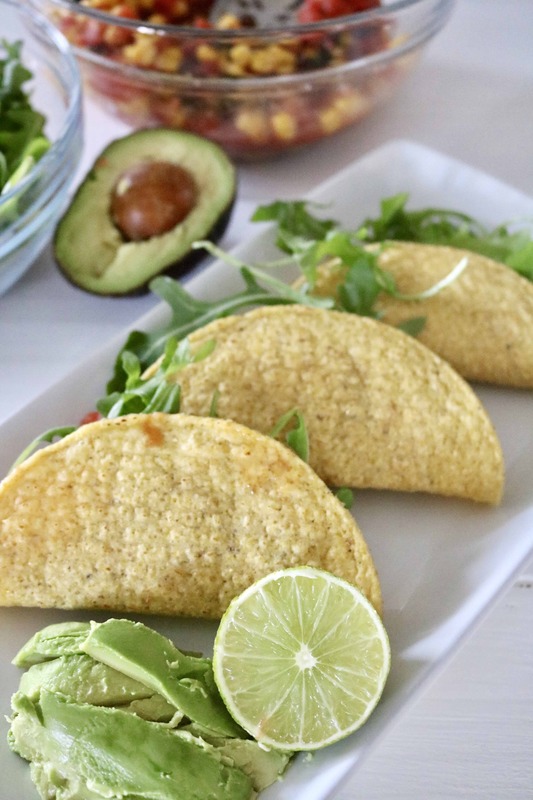 Check out the other Recipe ReDux’s great taco recipes below! Tell me- are you a hard or soft taco fan?! « Oven Baked Chicken Tenders – KFC Has a New Competitor on the Market! There’s nothing better than simple food that tastes delicious! Well done here Liz! Fabulous recipe, Liz! I like both hard and soft tacos, although recently I’ve been leaning more towards the hard taco shells. Gotta love that crunch! You are exactly like the hubs = he’s got to have that crunch too! 5 minutes…girl you are speaking my language! LOL glad to be in such good company! Yes mam! Just my style! These look so yummy! And this is SO how I do tacos. Anything in the fridge goes! Heck yes- I figured the garbage man taco wasn’t the best name- but it’s oh so true! lol! You totally had me at “5 Minutes Flat”!!! Yummy :-)And, I love the video. You are the fastest taco maker in town!!! You had me at TACO! YAY! Perfect recipe for a quick weeknight meal!